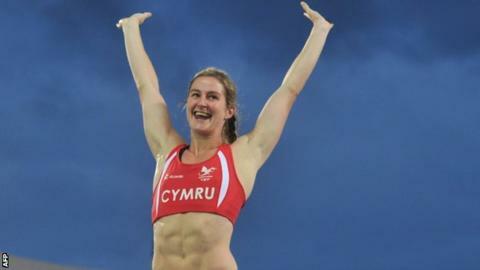 Sally Peake has won silver for Wales in the women's pole vault. In wet conditions on the final night of the athletics at Hampden Park, Peake led for most of the event and cleared the bar at 4.25m. The eventual gold medal winner, Australia's Alana Boyd went over at 4.35m. Peake needed to equal the Welsh record of 4.40m she set in Glasgow in July's Diamond League meeting, but she had to settle for silver. Defending champion Boyd finished on 4.50m. Peake's silver is just the third medal Team Wales have claimed in track and field. The other two came in para-sport competitions - with team captain Aled Sion Davies taking silver in the F42/44 discus and Rhys Jones bronze in the T37 100m. On the penultimate day of competition at Glasgow 2014, Chris Gowell was 10th in the 1,500m final and Elinor Kirk, was 12th in the 5000m final. The women's 4x100m relay team finished seventh setting a new Welsh record 44.51 seconds and Lee Doran was eighth in the javelin. Welsh Athletics is facing a post-Games review after looking set to fall short of the Sport Wales target of four medals at Glasgow 2014. Overall the Welsh are 12th in the medal table with 35 medals, eight more than the target of 27, set before the Games by Team Wales.